This is a win win. You can get your name on the frame, you can get your name in Women’s Enterprise Magazine, you can be celebrated in Social Media. You can get a handcrafted brooch all this while helping me say thank you to WBENC. I have 53 more days to get the funding to make this big THANK YOU gifts to WBENC. This photo above is a prototype of an original artwork that is being commissioned by people like you. Designed by artist, Gail Ahlers and made from steel, reclaimed lumber, recycled soda cans, and detailed with eco friendly paint. 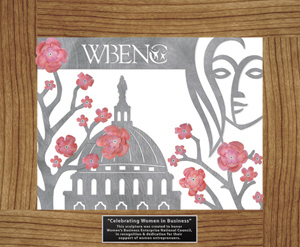 It will be 34 ” wide by 28″ high and once completed this beautiful wall sculpture will be presented in recognition to WBENC [Women’s Business Enterprise National Council] this June, at the National and held in appreciation from all the pioneering and trailblazing women of business. We need your help, levels of giving start at only $25.00. click here to go to the “Celebrating women in Business” project on indiegogo. Celebrate with us, and share this with your friends and family. Give your daughters, sisters, mother, or friends the belief that if they can dream it, they can make it happen by reaching out and working together. Believe in the Sisterhood of Prosperity. Quality content is the key to invite the visitors to pay a visit the website, that’s what this web page is providing.